A Sikh protester who was manhandled out of a Donald Trump rally today hit back at the Republican presidential candidate branding him as ‘childish’. 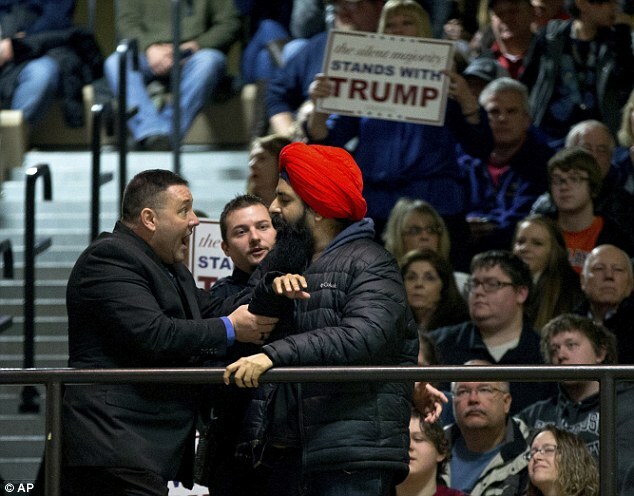 Arish Singh, who wears a red turban,was ejected from Trump’s rally in Muscatine, Iowa yesterday after unfurling a banner saying ‘Stop Hate’. Trump interrupted his address to the rally as Singh, 35, was ejected along with his friend Taylor Williams as the crowd repeatedly chanted ‘ USA, USA’. Minutes after the flare up, Trump went onto talk about terrorist attacks in Paris and California and referred to ‘hats’ several times. It was unclear whether it was a reference to Singh’s turban but there was outrage on Twitter that such a link could be made. Today Singh, a writer and comedian from Iowa City, Iowa, said he was unsure whether Trump had confused his turban for an Islamic headdress. Speaking exclusively to Daily Mail Online he said: ‘I am not sure what he meant when he used the word “hat”. ‘But if he thought I was a Muslim, I would not have a problem with that because we all have to stand with the Muslims and reject the hate that is being directed towards them. He admitted he had interrupted Trump’s address and his behavior had provoked Trump supporters. But he added: ‘This country has a history of civil disobedience and I am proud of that. ‘I want to speak out against hate and I will be back at his rally in Iowa on Tuesday. ‘Trump comes across as childish and sometimes he just mutters like an old man who has no control of what he is saying. ‘But he is in an important position because he is saying stuff from the position of a billionaire and the media is not challenging him. Singh said he was moved to carry out his personal protest because he believed Trump had been attracting support from white supremacists. He repeated claims which have surfaced of robocalls being made by white supremacist groups urging support for Trump and said he wanted to see the Republican frontrunner disavow such support. ‘I know that through robo calling, these white supremacists are showing their support for him and saying things like “America needs to be free of Muslims”. ‘Trump should speak out against White supremacists and say he doesn’t want their support. He should not allow them to support him and distance himself. ‘Since 9/11 attacks on Muslims as well as Sikhs who have been wrongly identified as Muslims have increased. ‘Those people who cannot tell the difference between a Muslim and a Sikh should be embarrassed of themselves. Men and women who have been initiated into the Sikh faith are known as the Khasla – and the turban is the most visible sign. Kirpaan: a sword, for protection. At puberty an initiation ceremony called the Dastaar Bandi (wearing of the first turban) takes place and young Sikhs are allowed to join the Khalsa. Singh uses his comedy act for political satire, including an attack on the comedian Jeff Dunham. Dunham has angered some Sikhs by using a turban-wearing dummy who is supposed to be ‘Achmed the dead terrorist’, a hapless dead suicide bomber. Singh added: ‘Dunham is a ventriloquist and stand up who has made an obscene amount of money using puppets to make bases stereotypes by packaging it as “family friendly” fare. ‘His “terrorist” puppet Achmed is supposed to be satirizing jihads but really just makes ethnic jokes about Muslims. ‘I’m all for real satire of jihadis. I loved the Four Lions film, but this is just getting applause for affirming and parading around stereotypes and dehumanizing caricatures. At the time of Singh’s protest, Trump was speaking about the September 11 terror attacks and the San Bernardino shooting. ‘We have radical Islamic terror going on all over the place, all over the world, and we have a president that won’t say it,’ the GOP front-runner said. ‘When planes fly into the World Trade Center, and into the Pentagon, and wherever the third plane was going. Trump abruptly stopped speaking as Singh stood up to reveal a sign reading ‘Stop Hate’. The crowd then erupted in chants of ‘Trump! Trump! Trump!’ and grew louder. According to ABC News, the chants alert security that a protester is in the audience. Next Monday voters will head to the polls as many of the presidential candidates have spent time campaigning in the Hawkeye state. His chief challenger in the Republican race is Ted Cruz. The next Christmas “Feed the homeless” #langar4all event will be at Piccadilly Gardens Manchester.